Comfortable and durable, this ComFiTec Plus horse blanket offers a remarkable value. It holds up great, even with the most destructive horses. An easy blanket to wash-and-wear, it's constructed of a 1200 Denier zigzag triple weave fabric with Repel Shell coating, which allows water droplets to bead and run off the blanket, preventing saturation while working perfectly with the waterproof and breathable coating. The memory foam wither relief pad contours to your horse's shape and lifts the blanket off the withers to reduce rubbing and provide added comfort. The traditional shoulder gusset aids in your horse's natural movement, and provides an especially good shoulder and neck fit for high withered and/or broad shouldered horses. WeatherBeeta ComFiTec materials are waterproof and designed to keep your horse dry. However, if your horse is turned out in a field without a run in shed or shelter during prolonged rain or heavy downpours, your horse may still get wet, especially in the neck and tail areas. You can't beat a Weatherbeeta ! Love it, great fit & quality. Fit is perfect, the weight is just right not to light or heavy. Finally got to whip out the blanket just the other evening. I always worry about my guy having enough space around his neck to munch on food. So far this blanket allows enough space and he seemed very comfortable even as I was fiddling with the strap lengths and buckles. This looks big for my petite Arabian, but it covers her well and is perfect when a midweight is too much and a lite is not enough. Wish it came in a different color so I could get one for my other horse, I don't want them to have the same color. Love it! The ONLY brand and sheet that fits my large shouldered, high withered TB. And I think Ibteued every other brand on the market, on all spectrums of the cost-scale. Itâ? ?s comfy, attractive and durable. Highly recommend! Weatherbetta blankets fit so well. Perfect fit and quality is just as was advertised! Great turnout sheet! Very comfortable. My horse tends to be on the skinny size although he grows a nice hair coat once it gets cool out. This helps to provide some warmth as the nights cool down as we transition to fall/winter. I'm very happy with this blanket and especially the memory foam padding in the withers. 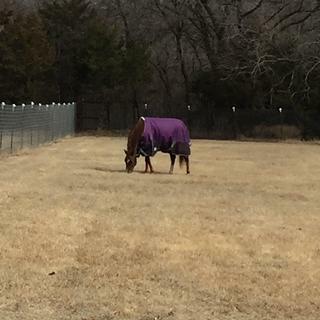 The blanket is very attractive and looks fantastic on my horse and the quality of the blanket is wonderful. I live in the foothills of the Sierra Nevada mountains in northern California and we have had extensive (welcomed) rainfall/snow this winter. This waterproof/breathable turn out blanket works exactly as advertised. My horse is comfortable and dry. There is no rubbing or loss of hair anywhere. He stays warm during freezing temperatures, through the snow and hail. Since I live in the foothills, our temperatures have only gotten down into the low 20's so this weight blanket has worked perfectly. I also appreciate the reflective strips on this blanket. Makes it easy to spot him with a flashlight at night. Nice added feature. The only negative thing I would say is regarding the front buckles: Be sure to fasten them so the latch faces the horse. My horse got this blanket caught on the 2x4 no climb fence when he was leaning against it because I had the latch facing out, away from the horse instead of in, toward the horse. Fits my high withered Morgan mare very well. Looks great. Looked forever to find a weatherbeeta 100 gram blanket. Purchased on good deal. Too cold out to use now so can't comment on how well it wears and washes. Runs big. Other than that, I love it! Wish it came in better variety of colors as I'm not a fan of purple, but it's a great turnout! Weatherbeeta has always been a good choice. They hold up well and last for several years. I have been having trouble finding a blanket to fit my horse - high withers, broad chest. I found an old WeatherBeeta I had from a different horse and it fits him beautifully and is well made. I wanted a light weight blanket and was so happy to find this. Can't wait to get it! I am a big fan of Weatherbeeta blankets as they've never failed me and have lasted for years without need for replacement. I had to buy this one to replace an Amigo sheet that ripped in minutes. I'm very excited for its arrival! Another reason I chose this particular blanket is because of the front clips. Buckles can be very hard to deal with once the temperatures drop below 20 here in CO.
My new horse has high withers but a broad chest, and blankets without shoulder gussets rub him. I have had good luck with Weatherbeeta blankets on other horses with similar builds, and I love the concept of the new wither protection. I also find the 100 gram turnouts hard to find, and they are perfect for our Maryland winters for unclipped horses that need a little protection for whom 200+ gram turnouts are way too heavy, especially when they come in to the barn at night. I want to replace my old tattered 100 g weatherbeeta. These are hard to find and this was a pretty good deal. The blanket with the 220 grams of fill was a bit too warm for her. I needed something a little heavier than the rain sheet. Hoping that this one with less fill will be the right one. Love these blankets though. Weatherbeeta are the best. Right amount of warmth and good reputation of weatherbeeta plus love the color! Good reviews. Needed a lightweight turnout. because I need a lite blanket and these are very hard to find this year for some reason. I kept going back and forth between the Weatherbeeta and another well known brand. I own several other Weatherbeeta turnouts which fit my big gelding very well and have caused no rubs. I need a 100g turnout which is very hard to find and ultimately placed my order for the Weatherbeeta. Will update once he starts wearing it. Breathable? What type of liner? BEST ANSWER: The liner is made of a "nylon" like fabric. I got this sheet last year for my horse. It's a great weight for southern California, and keeps my clipped horse warm enough at night most times of the winter. Hi,Yes it's breathable and it has a polyester lining. It's a good weight for the fall/spring seasons or in climates where it doesn't get super cold in the winter. Thanks so much for your help. sounds like what we need. The blanket is a med thickness. Very nice. Smooth liner. Does it have a lining and fill? I'd love to find a rainproof blanket with a soft lining like the heavier blankets have, but with 100 gram fill. BEST ANSWER: This does have 100g of fill. How do I pick my size?? BEST ANSWER: This blanket has been discontinued; 66 is the only size still available for purchase.